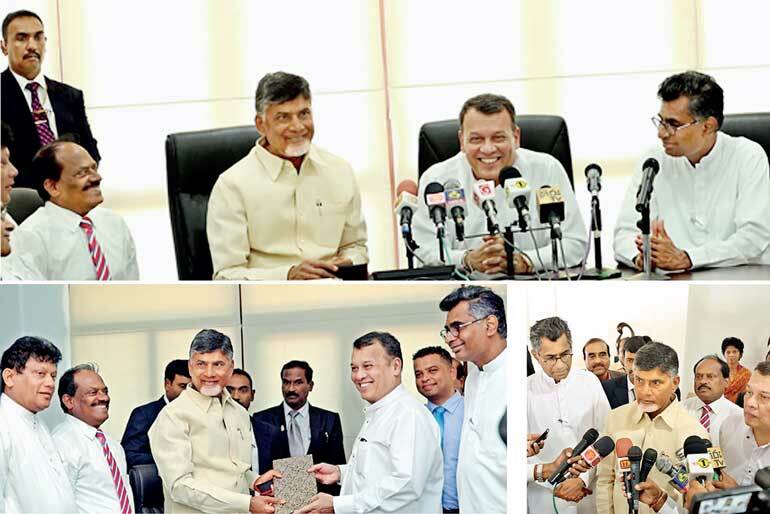 The Chief Minister of Andhra Pradesh, N. Chandrababu Naidu, visited the NSBM Green University Town Sunday 8 January 2017, accompanied by the Minister of Skills Development and Vocational Training Mahinda Samarasinghe. The Chief Minister is known for implementing important IT practices within his region and has been awarded with IT Indian of the Millennium from India Today, business person of the year by the Economic Times, South Asian of the year from Time Asia and membership in the World Economic Forum’s dream cabinet for his contributions. President of Sri Lanka Maithripala Sirisena has invited the Chief Minister to attend the celebrations of ‘Dawn of three years of sustainability of Sri Lanka’ as the guest of honour. Upon the chief minister’s request to visit a sustainable project in Sri Lanka, the president himself has directed him to NSBM Green University Town. Minister of Megapolis and Western Development Patali Champika Ranawaka, MP Malith Jayasinghe, Provincial Council member Gamini Thilakasiri, Secretary to the Ministry of Skills Development and Vocational Training P. Ranepura, Ministry officials, Vice Chancellor of the NSBM Green University Town, Dr. E.A. Weerasinghe, deans of faculties, academics, media and many other distinguished guests were present at the event.